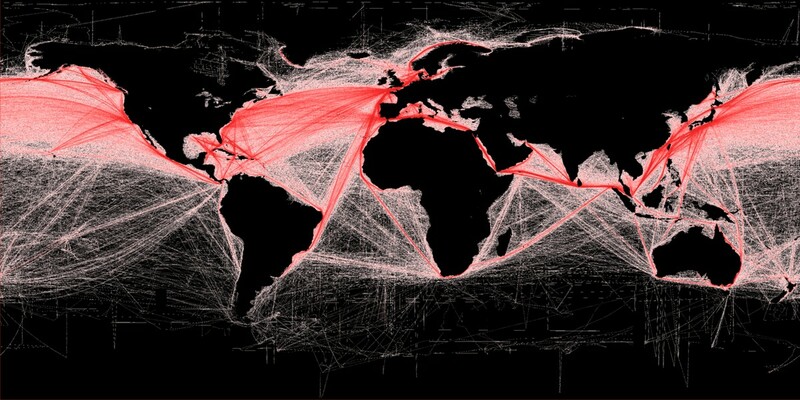 Shipping routes (2012). / Image: B.S. Halpern (T. Hengl; D. Groll), Wikimedia Commons, CC BY-SA 3.0. 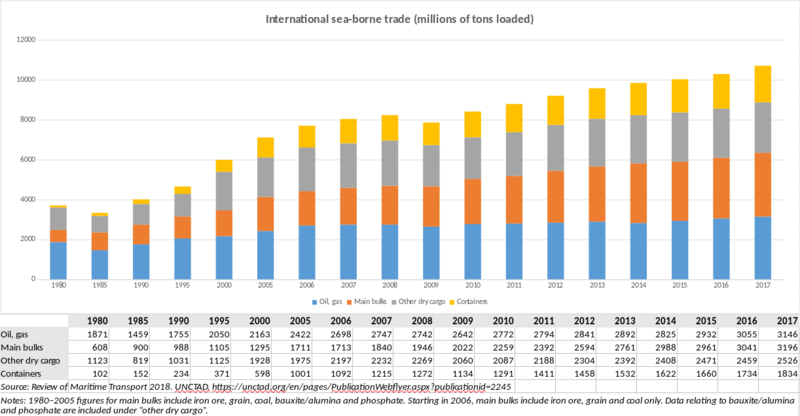 Maritime shipping carries 80% of the world’s trade by volume, or 70% by value. These are the routes over which empires have clashed, for which new islands are built out of sand banks, along which military bases are stationed, and over which enormous corporations compete. This post is a teaser of an upcoming short study on the subject. Here, you’ll find some interesting highlights and visuals. Oil transport has taken a progressively smaller share of shipped products since the 1980s. Containerised shipping, meanwhile, is a relatively new form of carriage for the standardised shipment of large metal boxes. Various products are transported by container, such as garments and shoes. Container ship. / Image: by Huhu Uet, CC BY 3.0 license. Iron ore shipments make up the largest share of cargo, at 1.47 billion tons in 2017. China imports 70% percent of global supply. Australia is the single largest exporter of iron ore. Australia and Brazil together supply 85% of China’s imported iron ore.
Stay informed with news delivered to your inbox. This helps us to gauge visitor interests and use of the website. This is how we can tell which articles are most read, which are overlooked, and how many people visit the website on a given day. Your IP address is anonymised (we mask 2 bytes of your address). Disabled by default. Toggle the switch twice (on/off) in order to save this permission as disabled and remove the privacy bar from view. Doing so will not activate cookies or scripts for metrics.